To download individual tracks or the whole album, click on the album cover to the right and go to iTunes. To order a copy of the album, select BUY A CD on the left-hand menu. The songs are also available as sheet music. To buy a copy of the kist o dreams songbook or a copy of the kist o dreams songbook and CD together, click on the songbook image and go to the shop page. Most of the songs I have chosen to include come from the first category, with a couple of examples from the third. 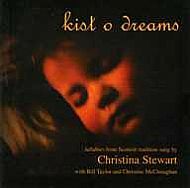 kist o dreams is not an academic exercise, it is intended primarily as a resource for parents and carers who want to sing to their children, and this was the basis on which the choices were made. Other songs were not included on the CD for differing reasons; for example the Bressay Lullaby appears on Lynn Morrison's Cave of Gold album, Griogal Cridhe is a little too dark in its content, and so on. The versions of the songs given in kist o dreams are the ones I sing. Most of these lullabies have other versions and some have a plethora. In some instances I am aware that the version here lacks the edge of other versions, such as when the mother finds the baby at the end of the Fairy Lullaby. Stick with whatever version suits you personally. I am a great believer that once you have learned a traditional song it is yours, yours to adapt and evolve if that is your choice. In my opinion that is one of the living parts of a living tradition and one of the beauties of singing traditional songs. In the past song collectors like Walter Scott and Marjory Kennedy Fraser have been criticised for tidying up and prettying up traditional songs, producing what they believed were improved and more acceptible arrangements of traditional songs, but historically, singers used a variety of phrases and lines when they sang a song, sometimes not singing the same text twice, but sticking with the overall meaning and shape of a song. This is particularly apparant in ballads and waulking songs. Don't feel remotely guilty about personalising a song or slotting in a few lines of your own, you'll be part of a long tradition. The only song in this collection which is still under copyright is The Miner's Lullaby (copyright Harmony Music).